Before Frédéric-Auguste Bartholdi (a French sculptor) ever heard of Bedloe’s Island (located in New York Harbor near the mouth of the Hudson River), the place was used (in 1738) as a “pest house.” Given its isolation from the mainland, authorities believed the island was very suitable to quarantine sick people. On occasion, hoards of visitors came to the island. A famous event took place during the summer of 1860 when about ten thousand folks witnessed the execution - by hanging - of Albert Hicks. The New York Herald reported that dramatic story on the 14th of July, 1860. But nothing, and no one, made Bedloe’s Island more famous than Frédéric-Auguste Bartholdi. Soon after John Wilkes Booth was killed by one of his captors, the Frenchman (according to legend) was enjoying dinner with friends in Paris. Commenting how good it was that the U.S. Civil War was over but how terrible it was that Lincoln had died, one of Bartholdi’s friends (Edouard de Laboulaye) had an idea. What if the people of France, gave the people of America, a monument to commemorate liberty? And ... what if they gave such a gift during 1876, the first centennial of American independence? France, after all, had played a key role in helping America to win her revolutionary war. Enthused with the idea, Bartholdi visited America and ultimately sketched his conception of such a monument. On the 18th of February, 1879, he was awarded Patent No. 11,023 - “Design for a Statue.” It would be placed on Bedloe’s Island - in plain view of immigrants being processed at nearby Ellis Island. The statue would be a colossus (inspired by the Colossus at Rhodes, once a wonder of the ancient world). Measuring slightly more than 150 feet high, it would have to be built in sections. Bartholdi received help from Gustave Eiffel who designed a ninety-eight foot inner framework - weighing 120 tons - supporting the statue. (Just a few years later, Eiffel built his own masterpiece - the 300-meter Eiffel Tower - which began its life amidst great controversy and was originally slated to be disassembled after twenty years.). Bartholdi’s workers are busy in his Paris shop. The statue’s head is displayed in a Paris park during 1883. The pedestal, on which the statue would rest, is paid for by the American people. It was not an easy task to raise the funds, but by the summer of 1885, the base of the pedestal is taking shape. The statue’s hand and torch demonstrate how huge the assembled monument will be. 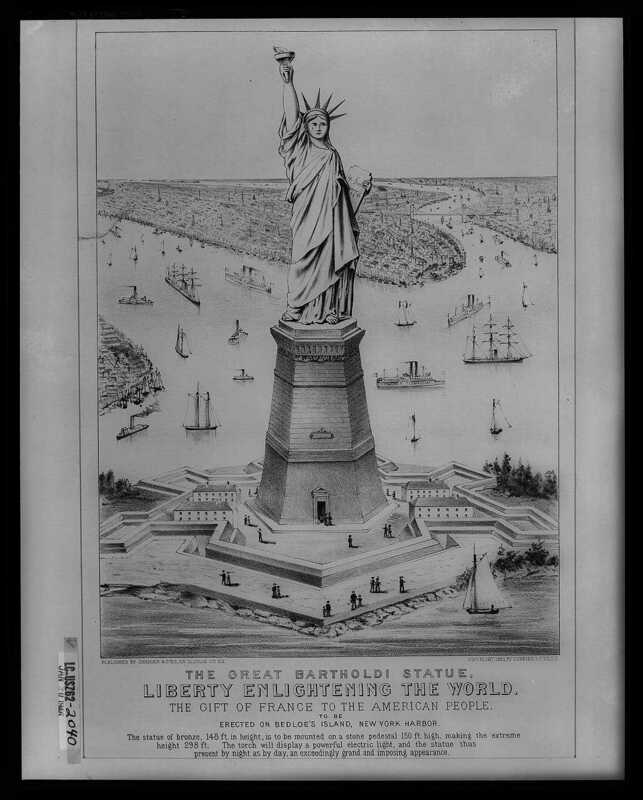 In 1884, Currier & Ives create a lithograph of the statue before it is erected in New York. Bartholdi's work - which he calls Liberty Enlightening the World - is transported to America aboard the French ship Isere. It arrives at Bedloe’s Island on Friday, the 19th of June, 1885. The U.S. Navy art collection contains a work by J.O. Davidson depicting the French warships Isere (in white) and Flore (firing salute) arriving in New York Harbor. The USS Alliance and USS Omaha, also at the scene, are mostly hidden behind the smoke. Cases containing the monument's parts are transferred from the ship to the island. After the statue is erected, the island’s name is changed from Bedloe’s to Liberty. In 1889, Americans who are living in Paris give that city a smaller version of Liberty. The thirty-five foot monument is located near the River Seine and faces west, toward its sister. The poem’s most famous lines - welcoming immigrants to America - are not exactly what Bartholdi had in mind for his greatest masterpiece. But sometimes the ultimate use of an object doesn’t always match the creator’s idea. Take, for example, the ultimate use of timber from Her Majesty’s Bark, the Resolute. Bos, Carole "THE STATUE of LIBERTY" AwesomeStories.com. Dec 01, 2007. Apr 23, 2019.